The answer to the overnight senseless slaughter of the innocent in Paris is known as a reasoned set of integrated ideas: classical liberalism. A philosophy and economics hard fought for from the Enlightenment that took the West to the pinnacle human civilisation once reached. Meaning the enemy is that repulsive reductivism of every identity politick, and every barbaric religion, that forces tribalism and sacrifice, and of every campus ‘safe place’ where the war of ideas against these cavemen from a death cult has been banned in case someone’s feelings are hurt. 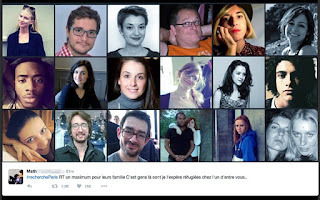 Paris happened because the West was lost decades ago under the berets of Left intellectuals. The only important picture to hold in our minds is of the individuals whose lives have been snuffed out to the void, which is the empty mind of every collectivist or theocrat who has handed over volition and responsibility for their actions to an Other – the State, Christ, Allah, Sauron, any other childish fantasy you can think of - and thereby chosen to become a monster. And a collectivism that would reduce these viciously murdered individuals to pointless symbols, which they were not, for they were thinking, warm blooded individuals just like you and me. Paris, last night, is the price paid when a society chooses to emote itself away from the only legitimate role of state: the protection of its smallest minority, an individual, and to instead sacrifice all individuals to the common good. Looking at what Europeans have allowed into their great pinnacle of civilisation and the self indulgence of the youth I would argue that thinking was the main thing missing.